We would like to encourage our supporters to support our friends at Fallen Angel Fund and help them when you can! 8-25-2015 Glitter is comfy in her carrier, ready to ride to Sparkle Central! Sue at Fallen Angel Fund sent her with some favorite toys! GLITTER had surgery this morning and now faces 5-6 weeks of recovery. The surgeon had a difficult time working to get the bones together on her forearm. Glitter had a lot of adhesions and strictures at her elbow and the surgeon had to work hard in order to get her elbow stiffness released due to her holding her leg up from her injury. When they tried to straighten the ligaments they were stiff. The surgeon took out two pieces of bone in her little paw. She had the nail bed removed from her injured paw. Glitter will have to return to the vet in 10 days for suture removal and will need two more x-rays (every 14 days) to ensure her leg is healing properly. Glitter is a very lucky girl and has a lot of followers cheering on her recovery. Her total surgery and medical expenses are going to be at $1000.00. Funds we are unable to raise towards Glitter's medical care will be offset by Fallen Angel Fund; however, they have many more kitties' lives to save and we hope our supporters will come through for Glitter so Fallen Angel Fund can dedicate their funds to cats that may not have the same luck Glitter has had with Sparkle Cat Rescue's wonderful supporters. The long white rod is the pin that is shown OUTSIDE of Glitter's body and simply appears as if it's going in her head but it is not. This is before the pin was cut to size. Glitter Post-Op She will remain with our friend Sue at Fallen Angel Fund through this weekend (August 15) and will then return to Sparkle Cat Rescue for a 5-6 week recovery period. 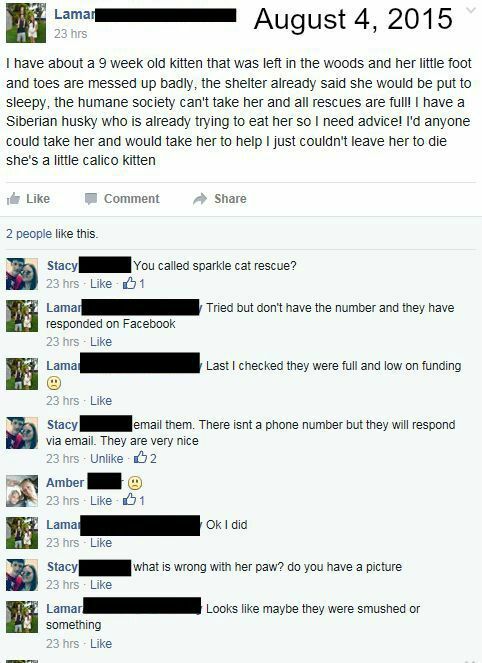 We received an update from Sue at Fallen Angel Fund today after Glitter's appointment at Lawndale Vet in Greensboro, NC. Below are two photos (front leg and rear leg). 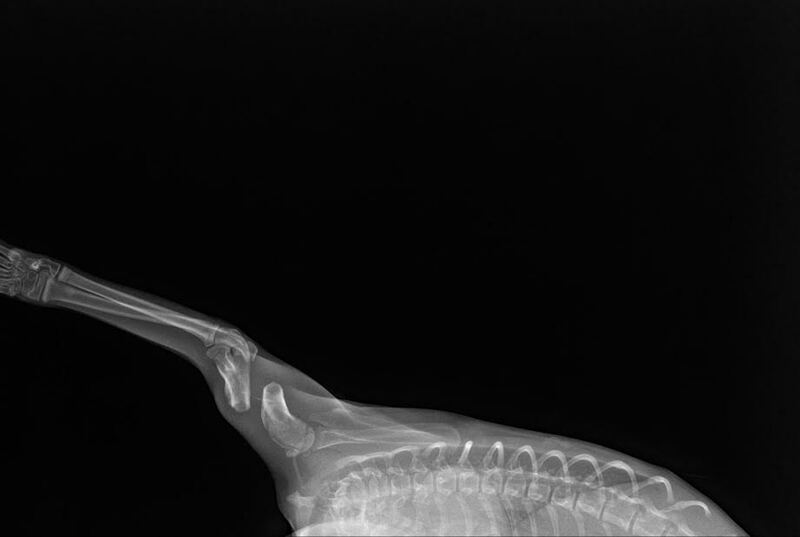 The back leg is believed to have been broken 1-2 weeks prior to the front leg break. Glitter will have surgery on Wednesday, August 12 and will require 4-6 weeks of confinement in a crate to ensure her leg properly heals. Her front leg has to be pinned with a metal pin that will run down the leg to hold the bones together and allow healing. Her back leg injury is healing and no pins will be required for that. With the loss of her toes on her front leg, she will have a limp. We are unsure if she will have a limp from her back leg injury. 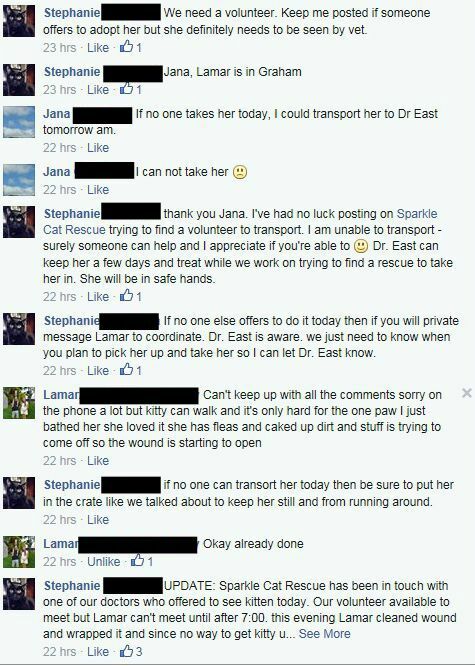 Glitter will return back to Sparkle Cat Rescue for her recovery once she has had her surgery. Abuse is suspected since these injuries occurred at two separate times. There is no soft tissue damage that could indicate she was hit with a stick or other object. As stated in our August 6 update, "Glitter has lost three middle toes (making a club foot), which is believed to have been caused by her being dragged. There are no external injuries to indicate an animal caused this damage. There is also a lapse of time between the rear leg injury and the front leg injury. The nail bed that remains on the one toe she still has will need to come out. Money raised will go towards her care and should the donations exceed the cost of her care, the money will go into the Sparkle Cat Rescue general fund to help the kitties we rescue with their medical care. Glitter's front leg. It is very apparent how severe the break is. She will have a pin inserted in this leg and will require 4-6 weeks of recovery time. 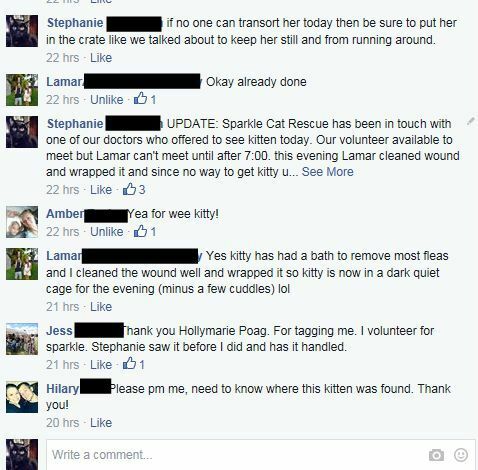 We received an update from Sue at Fallen Angel Fund for our Glitter Kitty. Sue met with the vet at Lawndale Vet in Greensboro, NC this morning after Dr. East dropped Glitter off there for x-rays and further assessment. 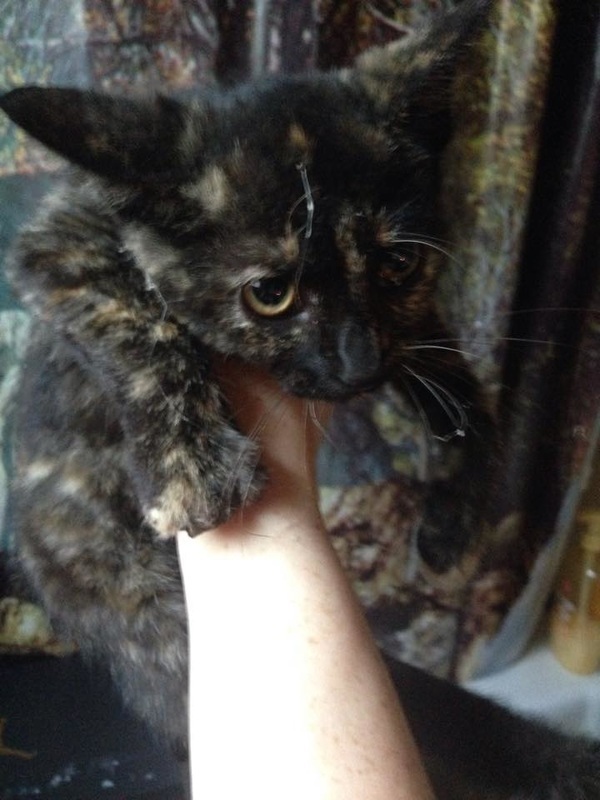 Glitter is a 9-10 week old kitten that was found in a wooded area and her story was posted on Facebook in the Alamance County Pets group on Tuesday, August 4, with a plea for help from her rescuers and we also received a private message with a request to assist and take her in. 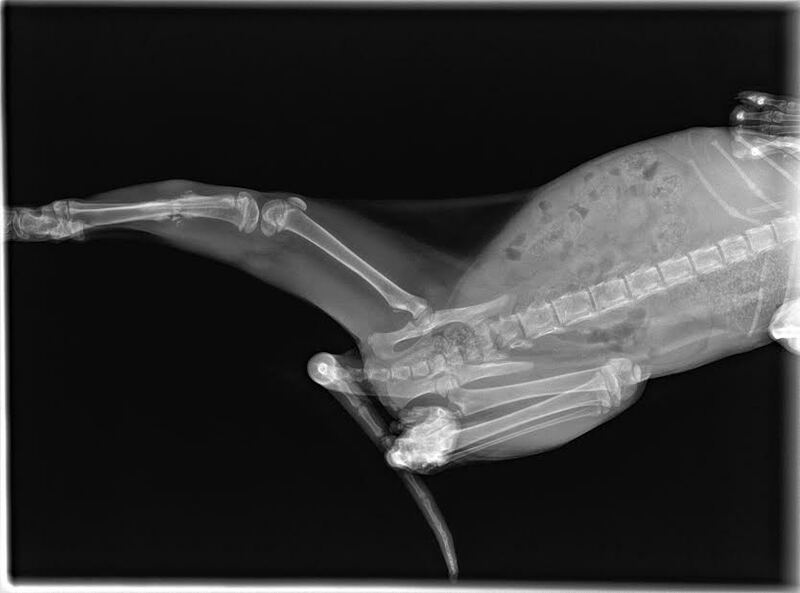 Upon examination this morning at Lawndale Vet, the doctor found her back leg had a previous break with evidence of a callous forming. This is definitely an older injury (possibly 2 weeks). The initial injury we were aware of on her front leg was assessed and she appears to have a fracture at the shoulder and has lost three middle toes (making a club foot), which is believed to have been caused by her being dragged. There are no external injuries to indicate an animal caused this damage. There is also a lapse of time between the rear leg injury and the front leg injury. The nail bed that remains on the one toe she still has will need to come out. It is believed that Glitter's injuries were caused by abuse. We have contacted Laws for Paws / Alamance County Against Animal Cruelty to conduct an investigation in the area she was found to ensure no other animals are being abused and dumped. 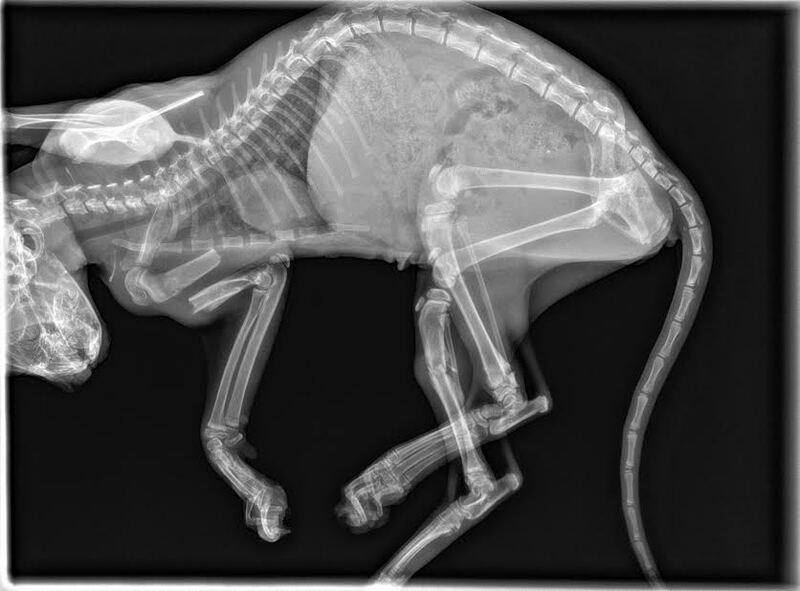 Glitter will be x-rayed at Lawndale Vet (their x-ray machine is currently out of order but expected to be fixed today - hopefully - so we can have a full assessment and more information on her injuries and future care. Sparkle Cat Rescue has been informed that Glitter will always have a very pronounced limp on her front leg and may limp from injuries to her back leg. We still do not know if amputation will be necessary until after an x-ray has been done. Please consider making a donation to the Glitter Kitty Fund - see top of this page to make a secure online donation OR mail a check to us at Sparkle Cat Rescue, Inc. / 2966 S. Church St., Suite 164 / Burlington NC 27215. GLITTER was found in the woods on Tuesday, August 4, 2015 and Sparkle Cat Rescue was contacted for assistance after the rescuers were unable to find any other rescues to assist. We are over capacity with all of our kittens and cats in the program but being that Miss Glitter is injured, this was an urgent situation. We posted on Facebook to find a volunteer to transport Glitter to Dr. Linda East in Greensboro so she could assess and give this sweet girl the medical attention she needed. Thank you to Jana for transporting from Graham to Greensboro NC early in the morning. Dr. East assessed Glitter (she named her also) and it has been determined that Glitter has a broken forearm. 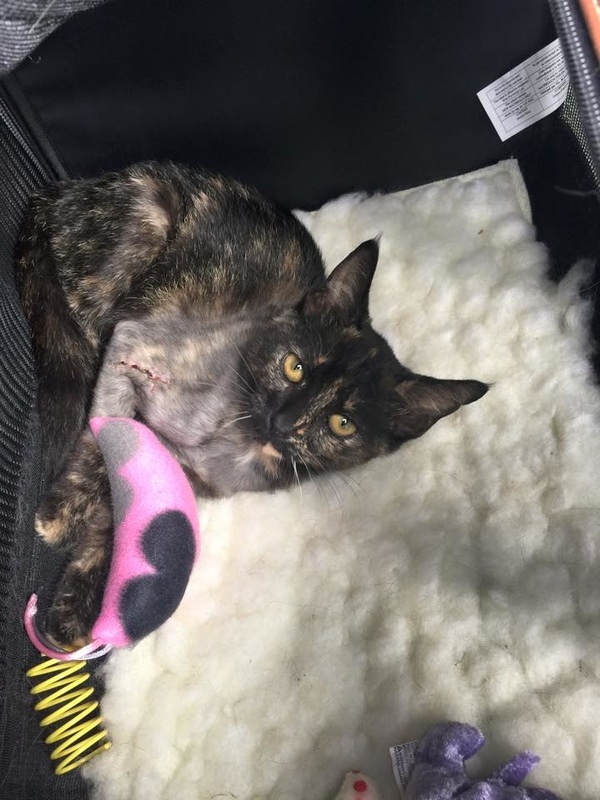 Dr. East is not able to provide further care so we contacted friends with Feral Cat Assistance Program to see if there were any funding options to help with surgery. We were referred to Fallen Angel Fund in Winston-Salem. 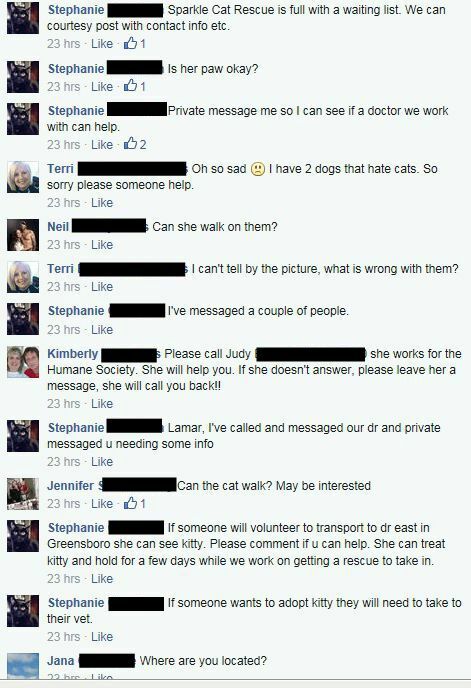 I called and spoke with Sue and she has arranged for Glitter to Lawndale Vet in Greensboro on Thursday morning. 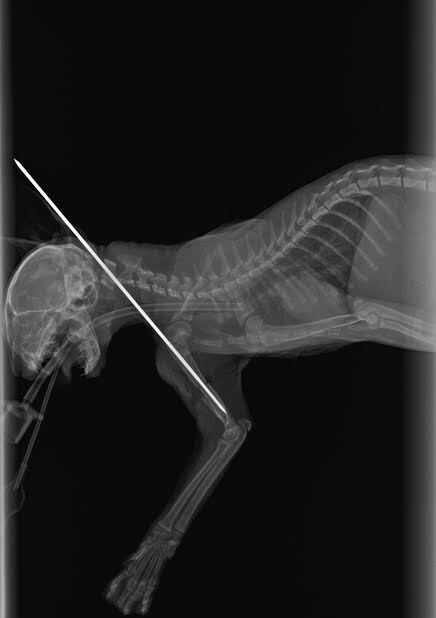 An x-ray will determine the extent of the injury. Please send positive thoughts and prayers to Glitter. Sparkle Cat Rescue currently has numerous other medical expenses with two Sparkle kitties, Spence & Havah's surgery for bilateral luxating patellas. Please click the link under the paw print at the top of our page to make a secure online donation. August 4, 2015 Glitter Kitty's paw injury as posted by her rescuer on FB. I weigh just 2 lbs. 6 oz. and am about 9 weeks old. Money donated to Sparkle Cat Rescue for the Glitter Kitty Medical Care Fund by donating via this link goes directly to help Glitter Kitty. Should Fallen Angel be able to cover her care 100% (we will not know until she has been assessed), we will donate the money raised to Forgotten Angel Fund to offset their expenses for Glitter. Glitter Kitty enjoying a nice meal provided by Dr. East! Glitter Kitty hanging out at Dr. East's office with SPCA kitty named Sparkles!